The Amish Chandler Dining Table is a thick, solid wood beauty with substantial table legs that curve outward, exuding grace and elegance. This is a dining table to gather at and it pairs beautifully with a set of Amish Chandler Dining Benches. The Amish Chandler Dining Table is built by hand by leaders in the Northern Indiana furniture industry and it is shown here in cherry wood. 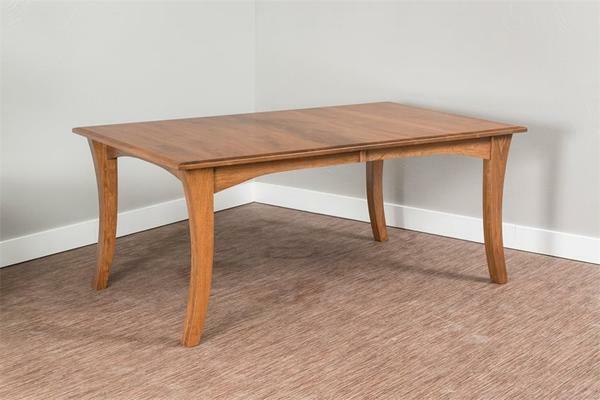 Every inch of the Amish Chandler Dining Table is rich with the wood you choose. Built by hand, this table is from the Bontrager Collection that originally began with crafting mission style tables, then expanded to include traditional and contemporary designs. They use only the finest hardwoods and all their tables are heirloom quality. We're excited to get things started for your table. Select options online with a few clicks or email or call us for one on one assistance. Thank you for taking time to visit us at DutchCrafters.